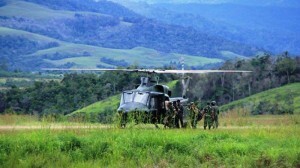 Thirteen military personnels who lost their lives when an Indonesian Army helicopter type Bell 412 EP No. HA-5171 crashed on Sunday (20/3) in Kasiguncu District, Poso Pesisir Subdistrict, Poso Regency, Central Sulawesi, at 5:50 p.m. Central Indonesian Time, attracted the attention of President Joko “Jokowi” Widodo. “My deepest condolences for the death of 13 Indonesian National Defence Forces (TNI) officers when an Indonesian Army helicopter HA 5171 fell in Poso. They have lost their lives when carrying out duties to the Country,” President Jokowi said in his twitter account @jokowi several times ago. As previously reported, the helicopter which carried 13 passengers has fallen at cacao plantation, in Kasiguncu District, Pesisir Subdistrict, Poso Regency while flying from Napu Village to Poso, on Sunday (20/3), at 05.20 p.m. Central Indonesian Time. The passengers on board were performing an operational assistance to the Indonesian National Police (Polri) in Poso Pesisir Selatan, Poso Regency, Central Sulawesi. In a press conference in Jakarta on Sunday (20/3), the Head of TNI Information Center Maj. Gen. Tatang Sulaiman explained that TNI is still investigating the crash of helicopter which was procured in 2012. Up until now, Tatang believes the helicopter crash is caused by bad weather when the incident occured. “It was raining in the area around Poso Stadium that will be used as the helicopter’s landing site,” Tatang said. As many as 13 people on board were killed instantly in the helicopter crash, they are: 1. Central Sulawesi Tadulako 132 Military Resort Command (Korem) Chief Col. Saiful Anwar; 2. National Intelligence Agency (BIN) officer Col. Ontang RP; 3. Military Intelligence Division (BAIS) officer Col. Heri Setiaji; 4. Palu Military Police Command (POM) commander Lt. Col. Teddy S. Prapat; 5. Korem 132 Information Chief Maj. Fakih Rasyid ; 6. Capt. dr. Yanto, Chief of the Health Division at the 1307 Poso Military District Command (Kodim); 7. Second Pvt. Kiki, the Assistant of the Korem 132 Commander; 8. Capt. Agung, Pilot; 9. First Lieut. Wiradi, Co-pilot; 10. Second Lieut. Tito, Co-pilot; 11. First Sgt. Bagus, Mechanic; 12. Second Sgt. Karmin, Mechanic; and 13. First Pvt. Bangkit, Aviator.